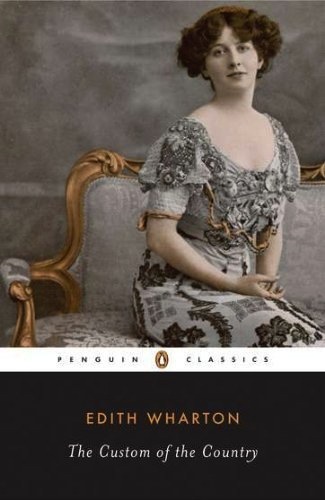 This week, I finished reading Edith Wharton’s, The Custom of the Country, starring your least favorite heroine and mine: Miss Undine Spragg (perhaps the ugliest name an author has ever bestowed upon a character). Undine Spragg: material-girl, ladder-climber, MERCENARY. I should point out that her initials are in fact “US” and some — some — have suggested that Wharton was using social commentary on the obsession with materialism in her home country. She grew up in New York City (Wharton, that is), got married to Teddy Wharton (who suffered from severe depression), won a Pulitzer Prize for The Age of Innocence, eventually divorced Teddy, then left the states to continue her writing in Europe. She died in Saint-Brice-sous-Forêt. Her unlikable (understatement! understatement!) character, Undine, is a pathetically self-centered, loathsome (albeit gorgeous) young woman. The worst wife, mother, daughter, human being you could possibly imagine. (She’s no Jack-the-Ripper, killing instantaneously, but spins her web slowly; manipulating good people into a slow kind of death; bankrupting them of their souls….and finances). She’s set on making her way up the nouveau riche ladder by landing a rich husband, buying expenses dresses and getting in with “the right set.” The ladder never seems to end for Undine. But one has to wonder if she is solely to blame. Because monsters (like Undine) are not born monsters. They are created. Spoiled rotten from crib to alter, she managed to dictate the lives of her middle-class (and eventually poor) parents via childhood/teenage dramatic tantrums and dark moods. The word “No” never seemed to hold much weight for Undine. Everyone (except her 3rd hubby) caved when confronted. She always got her way. Her miserable way. The symptoms of Undine’s nervousness were unmistakable to Mr. and Mrs. So although I may be completely exasperated with Undine, I’m not with Wharton. Not by a long shot. The Custom of the Country may be one of the best books I’ve ever read. What’s most extraordinary about Custom of the Country is that although you can’t help but detest Undine, you are riveted from page one, drawn to know what happens to her. A tour de force! Bravo, Edith! Yes! I now consider myself an official Wharton addict. I’m currently waiting for two books to be delivered: “Summer” by Wharton and “The Age of Desire” by…YOU! Thanks for visiting! Yes! I just recently read “Custom of the Country,” and it is definitely one of the best books I’ve ever read. I could not put it down. I downloaded the complete works of EW for 99 cents from Amazon onto my Kindle. Also recently read Summer, and several of her other novels. Superlative writer! Glad she’s getting some well-deserved attention: this month’s Vogue has a lovely pictorial article about her. Thanks for visiting Joan. I agree. I absolutely loved “Custom of the Country” and am just beginning “Summer.” My favorite — so far — is “The House of Mirth.” What a gifted writer. I too am so happy to have found EW! I liked Summer a lot. It’s more like a novella. Such a wistful quality to it. Can’t remember the names of the other EW books I read this summer, but they were all good. I’m in the midst of Age of Innocence now. I’ve never actually read it, but only saw the movie, which was great. House of Mirth is so tragic – also one of my favorites.